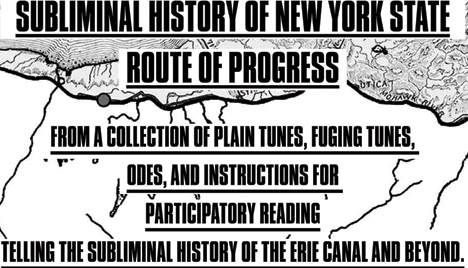 The Route of Progress rears its head from the heartland of New York. Its path traces the beginnings of globalization that resulted from the short-lived, yet enduring Erie Canal. Built along the Mohawk River and tracing animal tracks turned hunting portages, the Canal is the first uninterrupted water route connecting the Northeast to the Midwest. Quickly bypassed by the faster railroads, the Canal was obsolete after a twenty-five year heydey. Yet it burrowed into our history and culture, and remains releant today. The Canal opened the United States to itself, connected the Great Lakes to the Atlantic, and positioned New York City as an international commercial port. After the Canal's construction, the communities it bridged were open to worldwide business, carried whichever way the water went. This hybrid man- and nature-made waterway catalyzed our country's involvement in early global trade. The Canal's subsequent decline meant that globalization left Upstate as quickly as it had come. We need not solely look toward developing countries to see the effects of globalization, industrialization, and development. Here in upstate New York, in examining the land, with toxic refuse amidst bits of rich soil, these effects are just as clear. During the summer of 2007 Carrie Dashow and Jesse Pearlman Karlsberg took a two-month-long trip along and beyond the Erie Canal. They wrote fifty-three original songs and taught them to people along the way. Stopping in each town for under a week, Carrie would gather local information from various sources and write it into verse, handing it off to Jesse to compose. Jesse would hold traditional shape note singing workshops and the visit concluded with a participatory presentation where we would all sing and tell stories.